Learn in 12 hours in 2 days what and how digital transformation will affect you. 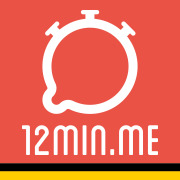 The 1st 12MIN.ME Conference in Hamburg: Everybody talks about digitalization, technology, disruption and innovation BUT where do we stand, what do we have to expect, and what does all that mean for society and for our daily life? It's about something that affects all of us: "Digital Transformation" the uncertainty that goes along with the rapid innovation, disruption and change of entire industries and market segments in which everyone of us is making a living from. Experts, innovators and founders will teach us what the buzz & fuss is all about, where the chances and risks are, how we can participate or contribute - individually or society as a whole. Figure out if the next 12 years will be more a utopia or if we are heading into dystopia and what's your stake in that. Innovation, progress and opportunity is everywhere! Don't miss out on being part of it because inspiration and fun is the least we have to offer. Who will win the 1st 12HRS.US-Award? Additionally to our conference we will issue in total 2! AWARDS on Thursday afternoon for FOUNDERS: One for female & one for male founder personalities. Tell us what inspired you: your favourite startups, ideas, projekts and achievers. Are you organizing 12HRS.US - SOCIETY DISRUPTED Hamburg (Tickets ONLY @ www.12HRS.US or Eventbrite)? Are you an organizer of 12HRS.US - SOCIETY DISRUPTED Hamburg (Tickets ONLY @ www.12HRS.US or Eventbrite) ?